I went to a Worcester High School, Blessed Edward Oldcorne where I completed my GCSE’s. When I left school, I was unsure what I wanted to do and my parents were steering me towards university and ultimately completing a degree. I decided to go to Worcester Sixth Form College and chose to do a BTEC National Diploma in Business and A-Level Sociology where I obtained Triple Distinction (equivalent to 3 A’s at A-level) and a C in Sociology. Because of my results this secured me a place at the University of Worcester to study Business Management. However I was having many doubts in my head whether I actually wanted to go to university as numerous factors were really deterring me away from it such as the increased tuition fees, did I even want to study business management? 3 more years of full time studying with no job guarantee? For these reasons I spoke with the university and decided to take a “gap year” during which time I ended up travelling to parts of South East Asia (Kashmir). Then came the moment when my life really changed (as I still wasn’t 100% convinced whether I wanted to go to university or do an apprenticeship). I was called into Sanctuary group for an interview and here I met with a lead finance officer who was also an apprentice mentor. Still to this day, she is one of my biggest inspirations as she told me all about the apprenticeship programme here at Sanctuary and I was sold! After a day or two I got a call from HWGTA to be told that Sanctuary Group had offered me a place to do the finance apprenticeship there, I was ecstatic and straight away accepted the offer. So now 3 years on since joining Sanctuary Group in 2013, I have not only had the unique experiences of working in different areas across finance such as the Rents, Sundry Debt, income and Accounts Payable team (because the nature of my apprenticeship allowed me to rotate departments every 6 months) but I have even completed all 3 levels of my apprenticeship, and I am now AAT qualified. On top of this qualification I got the opportunity to do a Level 4 Diploma in business skills through HWGTA which I have recently completed and submitted. I have also secured a full time role as a Development Finance Administrator in the Development Finance Team at Sanctuary Group. Whilst securing the new role I have decided that I want to now progress my accounting studies and I have a business case which is being supported and submitted by the Finance Director in order for me to secure funding for the CIMA qualification, this will give me a chance to become a Chartered Accountant whilst still working at Sanctuary. On top of my academic achievements I have also developed my own personal skills since starting my apprenticeship, as I have become a more self-assured and confident person. It is through the apprenticeship that I realised that I love public speaking. Using this new skill, I am now regular promoter of both Sanctuary’s placements and the programme delivered by HWTGA at careers fairs and special events. 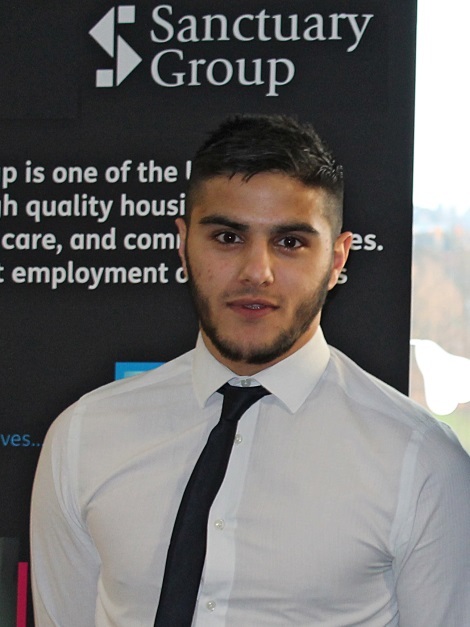 And have recently joined the West Midlands Young Apprentice Ambassador Network on behalf of Sanctuary Group. I have also helped local MP Robin Walker to advocate apprenticeships locally and in doing so was asked to attend Worcester Sixth Form College to talk about my experiences and promote apprenticeships as a fantastic combination of gaining skills, experience and developing as a person – something I don’t believe you get anywhere else. To thank me for my work on this I received a personal letter from Sanctuary’s CEO which was really rewarding. My apprenticeship has made me realise that I have a lot to give both in work and in the community. Sanctuary offers volunteer placements and my first placement was at New Hope, a local community centre where children with disabilities can play whilst their carers take a break. After my first visit, the staff and children wanted me to come back so much that they contacted Sanctuary directly and I now visit whenever I can during breaks from work and college. I have worked hard every day within the various teams I have had the pleasure to work in; helping to achieve Sanctuary’s goals and improve the service we deliver. I enjoy working with others and also independently and leading on projects. HWGTA recognised my on-going dedication to both my role and my studies by awarding me the ‘Excellence in Accountancy’ award in 2015. I believe that others can learn from my experience because although I planned to get a university degree, I’ve had so much more from my apprenticeship. I have my whole career planned out as a result of the apprenticeship pathway. My experiences have made me a more driven person who proves you can grow and succeed through an apprenticeship. Over the last 3 years I have developed my own skills and experience through apprenticeships and I am driven to inspire others to do the same. I have been involved in many projects and activities to promote apprenticeships including attending career fairs, discussion groups encouraging local businesses to take on apprentices, as well as giving talks to students at colleges. I also suggested and now coordinate the AAT buddy system for Sanctuary Groups apprentices; this is proving to be an invaluable support network especially for new apprentices that join the company. I’ve been lucky enough to meet many apprentices across all types of industries and I have to say the future looks bright for apprentices. I truly believe that anyone can do an apprenticeship, whether they actually enjoy studying or even if they don’t, an apprenticeship works both ways. It is important to think of an apprenticeship as a stepping stone to help push individuals forward. The way I always tell them is you won’t be an apprentice forever, but when you come out of the other side, you will really feel you have achieved and learnt so much. You get to gain relevant qualifications, whilst getting valuable work experience and at the end of it being debt free, how can anyone say no?